In 2017 there were 3,756 deaths and 15,074 hospital admissions due to drug poisoning recorded in the UK, which is a 51% increase on 2005/6. Many of these were caused by the consumer being unaware of harmful substances present in the product. For example, chemicals such as PMA and NBOM that can cause death in very low doses are regularly found in ecstasy, and cutting agents levamisole and phenacetin, that cause cancer and skin necrosis, are often used in large amounts to bulk up cocaine. Death and hospitalisation rates can be improved from the use of the kits by enabling the consumer to make an informed decision. This has been proven using testing stations at festivals, where death rates have reduced by 95% and as many as two thirds of people discarded their drugs after knowing their true content. As is found within medical ethics, we have a responsibility as a society to protect people’s autonomy as a basic human right, and true autonomy cannot be accomplished with missing information. From a hedonistic stance, it can be argued that everyone is entitled to freedom of choice, and that the pursuit of pleasure is the most important goal of human life. Therefore, if a person wishes to increase their personal pleasure by consuming illicit drugs and this action does not hinder others from also experiencing pleasure, then this is not wrong. At-home testing kits providing access to a more informed decision enable this freedom of choice and decreases the likelihood of causing distress for another person. Welfarism says that the best action is the one that most increases the economic well-being or welfare for the people. The knock-on effect of the availability of these kits on the NHS has the potential to be beneficial to society and public health and therefore promoting welfarism. This is true both through the reallocation of time and resources currently allotted to treating drug poisoning cases to other services, and through data collected from the distribution of the drug kits such as quantity and location of drug usage. Access to this kind of information would also allow the NHS to focus on providing support where it is needed and use resources more efficiently. As is well backed-up back pragmatic ethics, the moral progression of our society is seeing the use of illicit drugs become more acceptable in many circles. As a result of this, care ethics and our natural instinct of benevolence to reduce harm to human beings to the best of our ability indicates that at-home testing kits should be as accessible as possible. The two core counter arguments that evolve in this debate are; how the introduction of these kits will affect existing and noncommittal users, and the associated cost impact on the NHS. Currently, existing kits are not widely available and their introduction into the NHS will significantly promote the use of illicit drugs at a cost to the UK taxpayer. By exploring utilitarianism theory, the best action is the one that brings about the least amount of harm to all parties involved. Hence, the promotion of safe drug use by the NHS may encourage noncommittal users, who are currently hesitant, to more confidently take illicit drugs. Subsequently, this increases the number of users across the UK, which clearly violates the no-harm principle, due to the greater number of people at risk. Although you may believe the introduction of these kits is likely to reduce the number of deaths caused by harmful substances, the rise in the number of drug users is also likely to increase the number of deaths linked to misuse. Of the 3,756 drug related deaths in 2017, two-thirds are associated to drug misuse, highlighting the limited benefit these kits will have in reducing overall drug related deaths in the UK. The continuous change in drug composition makes accurate testing for harmful substances difficult, which could potentially hinder the kits reliability. In the perspective of a manufacturer, exploring Keenan’s virtue ethics where “an action is only right if it is an action that a virtuous person would carry out in the same circumstances” the question must be asked; is it right to provide a product that could potentially mislead consumers with severe consequences? Employing social contract theory, one can say that an individual has the right to privacy, but also the duty not to invade the privacy of others. However, in modern day society complete anonymity is unrealistic, with various companies facing increasing public scrutiny for data scandals, such as Facebook. With this in mind, people are reluctant to share basic information, let alone inadvertently admitting to using illicit drugs, especially to a government entity that will always condemn their use. By definition, illicit drugs are “forbidden by law”. Kant’s Categorical Imperative states that you should “always act so that you may also wish that the maxim of your action become a universal law” therefore, if breaking the law is wrong then promoting this is also wrong. For this reason, the statement “it is OK to do illicit drugs” cannot be universally applied. Of the three million UK drug users in 2016/17, only 0.1% had a drug related death. With this miniscule chance coupled with a known and trusted dealer begs the question: Why do you even need the kit? In your lifetime, you are 10 times more likely to die in a car crash! As a group, we are of the opinion that the NHS should not provide illicit drug testing kits for free as they offer limited benefit to society at the expense of other areas in need of funding. I agree with the second statement that the drug kits should not be available on the NHS for free. The taxpayer should not be responsible for ensuring that some people’s use of illegal drugs are safe, you make the decision to disregard your safety when you take the drugs. By not making these free it might help deter people as they could be worried about the safety of drugs. There are not enough cases of drug-related death vs level of drug intake for it to be justifiable for drug kits to be free – if someone with a strong drug addiction was taking multiple hits a day, they could go for years potentially with our having negative effects which would cause them to go to hospital. Drug testing each new batch of drugs they get could potentially cost thousands for the NHS, which could have paid for their treatment in hospital in the first place. I think there enough people out there not getting the service they deserve from the NHS due to a lack of funding – be it someone waiting for an ambulance because its still at the hospital waiting to discharge its last patient due to a lack of beds, or someone in chronic pain waiting to see a consultant. Quality of illicit drugs is a problem that poses public health issues, but it is one that should be borne by the consumer of those, who, lets be honest, are committing an offence buy them in the first place. So I suggest an alternative: provide a means for those “consumers” that wish to put their own lives at risk, but at their own expense – be it by vending machine or other such, so as to protect their anonymity and remove the “stigma”. Really good read! Agree with the initial decision. I think there are much more important things which require financial support via the NHS, rather than supplementing the “safer” use of illicit drugs. In addition to the points stated, I suggest consideration should be taken regarding the potential environmental impacts. This would be in relation to – how the drugs used in the test would be disposed off? where would they end up?….most likely in water works, this would cause issues for wastewater treatment. Interesting read. 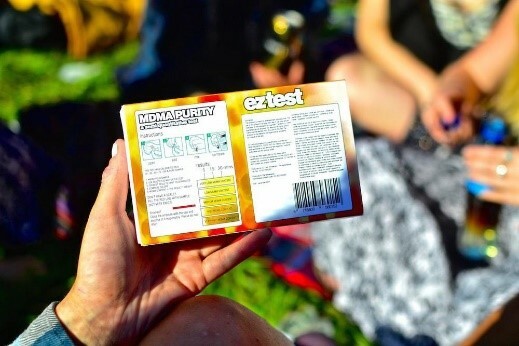 I never realised they had drug test kits available at festivals. I think this may be one of the only places they’d work well though. A lot of people taking drugs at festivals are for the first time so probably find it easier to think about testing and then throwing drugs away. I bet most who take drugs regularly really won’t care if there drugs have carcinogens and whatever in. And ultimately I totally agree that the NHS has much more important things to think about and spend there little resources on. It’s the same sort of debate regarding smokers and whether they should be treated. An interesting article and I agree with the groups initial opinion. I feel that providing testing kits would encourage younger people to use illicit drugs who would previously been unsure due to the dangers. Taking illicit drugs is illegal for a reason, so providing a testing kit defeats the purpose of being so against them. I think however that there are some benefits to them so there should be more public awareness of them but only for people to buy themselves. Spending nhs money should be more focused on actual needs of the population who dont have a choice in their health. This is an interesting topic. I am personally against all illicit drug use (it is illegal for a reason), but the death of drug users isn’t going to stop the drug culture. I think these drug test kits should be available, but at no extra cost to the taxpayer, with the budget coming from the NHS budget for drug users. These kits, along with the cooperation of the patient/ drug user should be used to track down the dealers (bigger fish) of the drugs, fake or not. A similar attitude should be taken to the ‘drug consumption rooms’ populised by the Netherlands- people know it’s not legal, but they provide a safety net to ensure people don’t needlessly die from (fake) drugs. The other argument would be freedom of choice vs the encouragement for people to take illicit drugs now there is a relatively anonymous safety net available, but again it comes down to the value of a human life and particularly younger people who are just experimenting while at university (or something equivalent at that stage of life). This is a very interesting article as it’s not something I have ever really considered. I have always been of the opinion that using drugs is bad unless they have been prescribed. I do not think that illegal drug test kits should be provided for free by the NHS. Instead I believe that a more economically viable technique would be to raise the quality of drug-related education. Education, being a non-tangible service automatically saves money on fixed costs relating to production of such testing kits. I believe that once education is raised then people are by default, more likely to research the effects of their chosen drug and ultimately will drive inquisition as to the purity of their product. As a result, more people, as a proportion of the total population of users, are likely to search for testing kids online which are widely available (since the kits are legal chemicals themselves such as Mecke reagent and Marquis reagent). I liked the use of statistics in this report, paired with the well-defined economic concepts which, on the whole provided sound backing to points made on both sides of the argument. I feel that the overarching realisation that most drug related deaths are from “misuse” as opposed to “product purity” gives further precedent that adding costs by way of testing kits is futile. I believe these drug test kits should be illegal and more funding placed on the education of these illicit drugs. Drug test kits would simply encourage people, particularly younger, uneducated minds, to try these drugs. This would therefore increase illicit drug use rather than prevent it. Better education on the side affects and consequences of taking these drugs would do a much better job in reducing their use as it will allow people to make informed decisions on using them, being fully aware of all the facts. An interesting article and I can see both sides of the arguments. However, I particularly liked the argument about utilitarianism theory and agree that if drug kits were being provided, especially by a government owned organisation such as the NHS, this would increase the use of drugs and overall the number of deaths caused by drugs. Also, the point raised about drugs changing and the kits being unreliable is an important one. People could blindly trust these kits and use drugs which may be more unsafe than they believed. I do not think the NHS should provide free drug kits, as I agree with the fact that drugs are constantly evolving and changing composition, therefore, a drug kit will become useless and in a more serious case become harmful. It will also cost the government too much money to keep modifying the drug kits as the illicit drugs are getting modified even faster. A thought provoking article. For me the issue is the medical concern to treat injury and to prevent harm. The drug testing kits are designed to reduce harm and to prevent death, therefore I support them. Of course, the counter argument is that the kits are supporting an illegal activity. However, the medical profession may argue that their duty is to treat their patient and to encourage them to adopt practices that prevent harm; their duty isn’t to judge a patient’s behaviour. I like the way this article presents both for and against arguments before offering the writers own view, along with the use of interesting statistics to back up the points being made. I believe that the use of drug testing kits is a good idea to enable individuals to make a more informed decision about taking an individual drug, however as this article stresses the kit would only give results for the drug corresponding to the individual sample tested and is therfore more suited to the festival environment where inexperienced drug users are more likely to be using. However I do not agree that the kits should be issued by the NHS. The NHS is already strained and therefore the limited resources should be used in the most effective way to provide the greatest benefit to the public. Regular drug users are unlikely to use the kits to test all their drugs before use and therefore the investment would not pay off. If people can afford recreational drugs they can afford to test them. Furthermore, if the kits were available on the NHS this would serve to promote recreational drug use and create a false sense of security that because the sample is free from extremely dangerous substances it is entirely safe to take and that an adverse reaction to the actual active component is not possible, which we know not to be true as peoples response to drugs is individual. Therefore more deaths could result from the use of the kits if the results are misinterpreted or misunderstood by the user. I like the way this article is presenting a very controversial topic and presents both sides of the argument clearly helping us to understand both view points. While providing the testing kits may help to reduce drug related hospitalizations and deaths I do feel that this will only treat the symptom of the problem and not the cause. These kits will provide the safety users want from harmful compounds in the drugs but the use of drugs is still harmful anyway. I don’t feel the kits should be provided by the NHS as it will sound like the government is supporting the use of drugs when the majority of people will want them the tackle preventing their use. This has been an interesting read and I agree with the initial opinion. I’ve always had the opinion, as have others in the comments, that illicit drugs are illegal for a reason. I understand that these kits may reduce drug related deaths but their effectiveness relies on the NHS consistently improving them as illicit drugs evolve. This would then need additional tax payer funding into research on top of the funding into the production of these kits. Why should tax payers pay for this? This money could go into the research of other life threatening diseases and illnesses for people who are not optionally taking harmful substances which are illegal for a reason! Great read! Similar to what AaronY mentioned about targeting festivals, I think that this form of testing should be promoted. It focusses on many first time users who may be pressured into taking drugs at these events. Being able to inform and test drugs for people just before “stepping into the scene” would be a big deterrent. Also, these new users may not know what to look out for and maybe purchasing from an unknown source. This method of support would be much smaller in scale than a nationwide rollout, so would not incur the same issues presented in the article but still be greatly beneficial to the public. Using Kant’s theory of it being right if everyone else would do it is difficult to use in this scenario, on one side giving everyone the ability to see what they are putting into their body should be everyone’s right, but also allowing more people to get involved in drug culture will be considered wrong by many. Very interesting subject, I would be interested to see your final verdict after this discussion. I think the article raises interesting questions about ethics and a person’s right to freedom. I think having these kits at festivals and nights out is essential to ensure drug use is as safe as it can be as I think statistics show people will continue to use drugs regardless of UK laws.